New York, NY September 27, 2017 Atomic Crush Events (ACE) is pleased to announce the return of Comic Con Revolution (CCR) to Ontario, California. 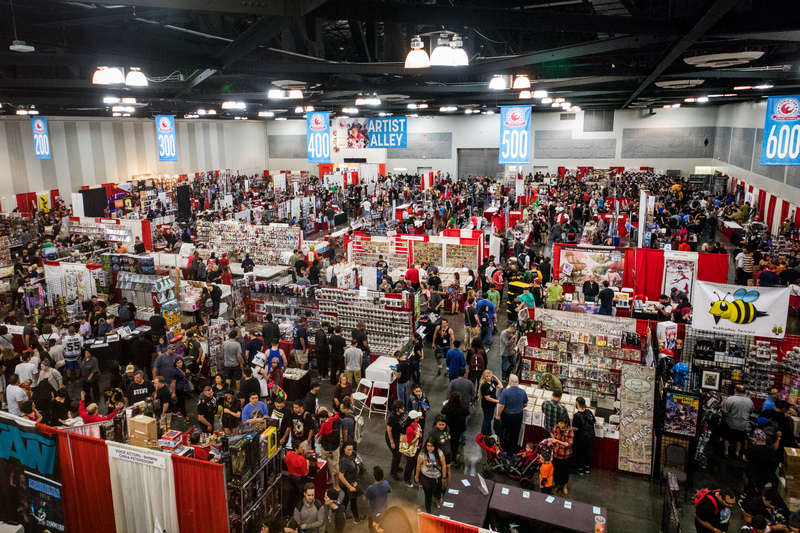 The second annual comic con will be twice as large as year one. 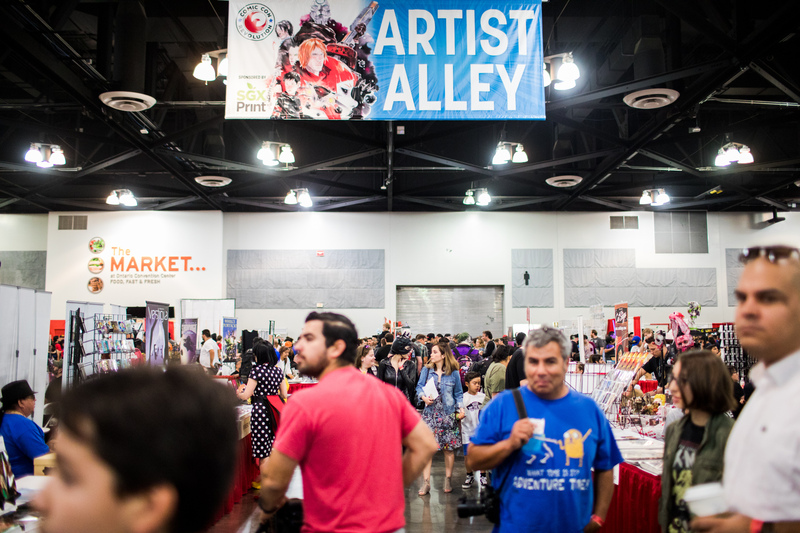 Over double the square footage, more exhibitors, more vendors and even more guests. CCR will be held on May 19 & 20, 2018 at the Ontario Convention Center and will feature two full days of programming. The initial guest list boasts some of the most incredible talent in the industry including Jason Aaron (X-Men, Star Wars), Sandy King Carpenter (Film Producer & Comic Writer), Ming Chen (AMCs Comic Book Men), David Lafuente (Archer & Armstrong), Dustin Nguyen (Descender), Stan Sakai (Usagi Yojimbo), Cat Staggs (Wonder Woman), Timothy Zahn (Star Wars Novelist). Many more additional announcements will be made before Comic Con Revolution opens its doors for year two. Not satisfied with just growing exhibit hall and the guest list, Comic Con Revolution will now play host to two days of programming full of panels and events for the entire family. They’ll also be producing the second annual Cosplay Revolution Costume Contest hosted by Ming Chen with the winners receiving one of the most unique awards ever. The ultimate goal is to create a full weekend experience. 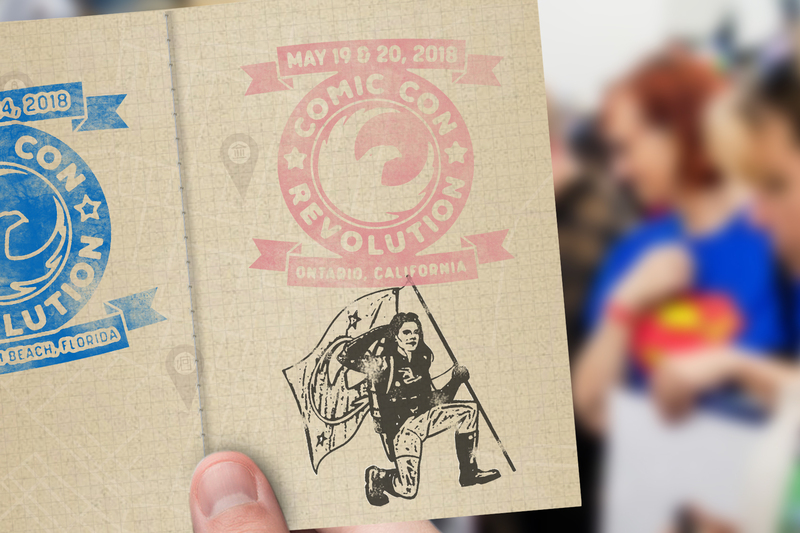 Tickets are on sale now and can be purchased by visiting the Comic Con Revolution website. Also available are exclusive logo enamel pins, pint glasses and tees. 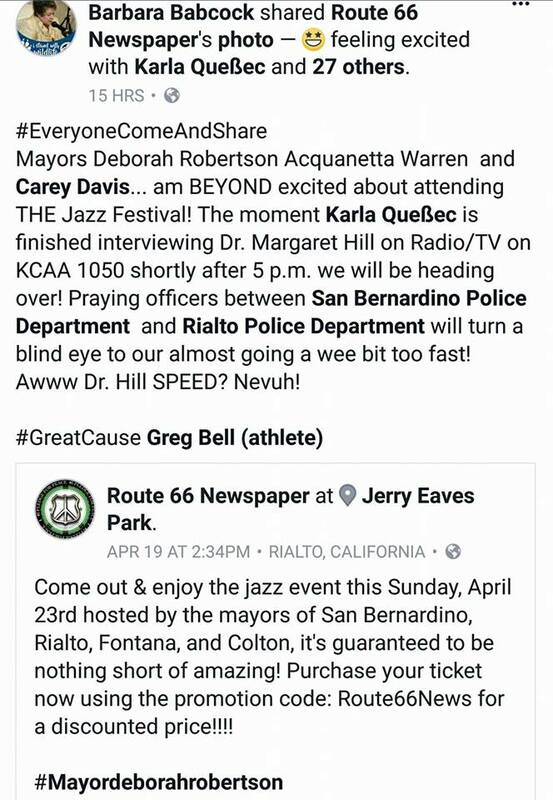 Rialto Mayor is looking to give $100,000 contract to her friend Luvina Beckley who is the CEO of MHM & Associates to run and facilitate the State’s Prop 47 Grant. Besides being highly inappropriate given the relationship they share. 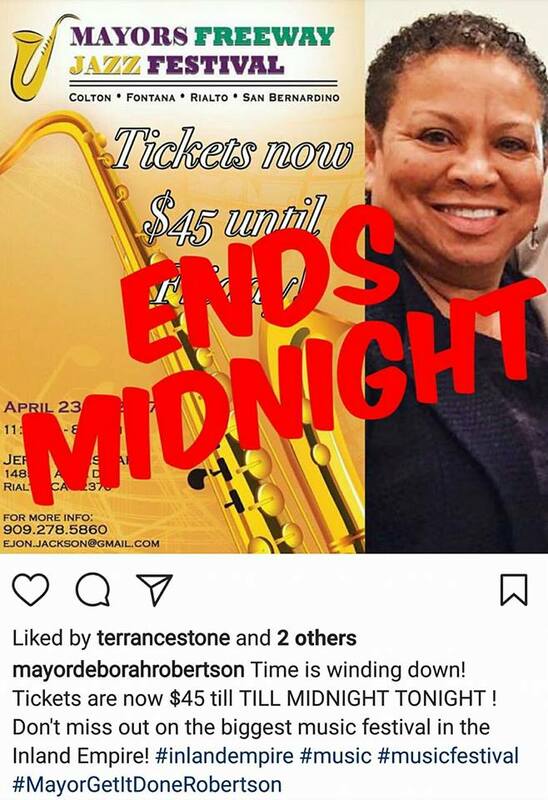 It’s also odd that the Mayor is giving Luvina Beckley access to run a state grant because Luvina Beckley has been disbarred from having anything to do with Federal Grants for three years. 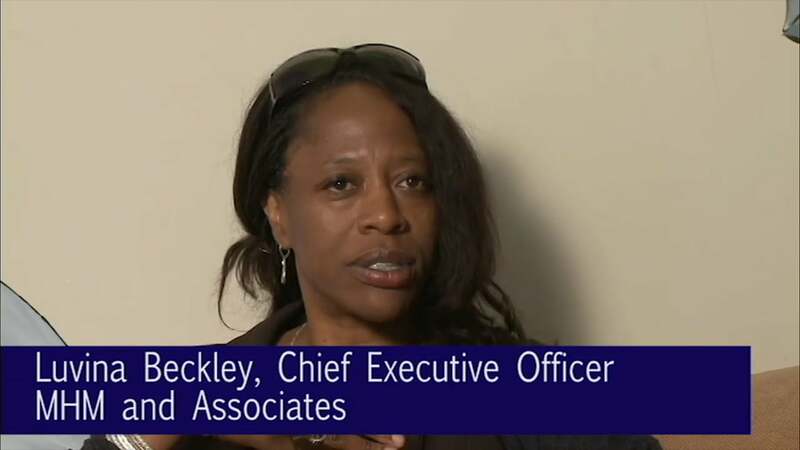 In a letter from the National Corporation for Community Service spells out why Luvina Beckley is being disbarred. “Accordingly based upon the reason set out in the August 19th 2016 notice of proposed debarment which is hereby Incorporated by reference and further discussed above I hereby confirm my earlier decision to debar you for a period of three years this department is based on the determination that you. Violated the terms of a public agreement or transaction so serious as to affect the Integrity of a corporation program. Engaged in inappropriate activity that was so serious and compelling a nature that it affects your present responsibility to engage in transactions with the federal government. This department is effective for the following cover transactions as specified in 2 CFR part 180.
program monitoring, report writing, compliance, project data collection and program recommendations. 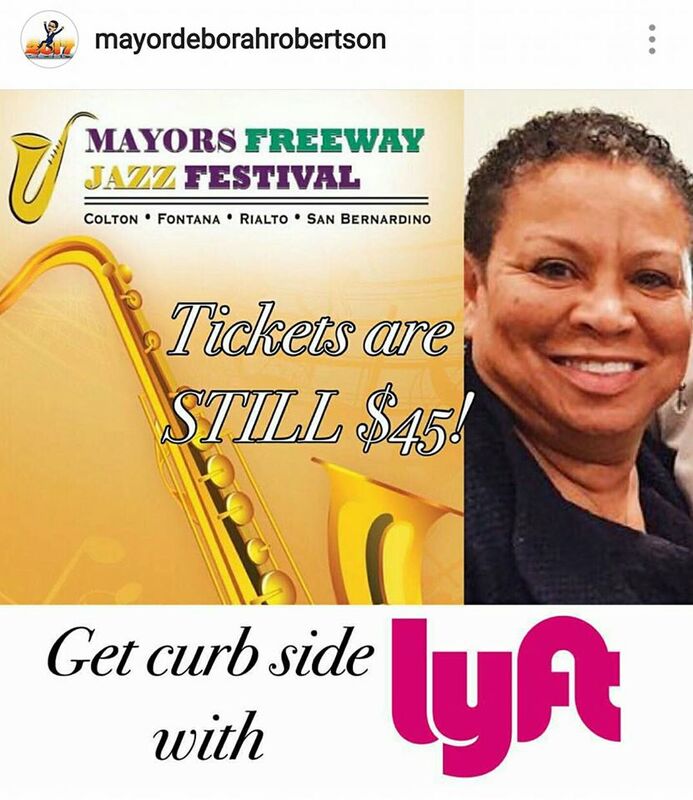 Luvina Beckley who has been not only a close person friend of Mayor Robertson but also a political ally of the Mayor and Council members had been working on Federal Grants over the past 3 years. Before his passing Councilman Shawn O’Connell grew uneasy of the way MHM & Associates were handling grants on the cities behalf but lacked any support from his fellow council members to bring things under control. Now we are allowing a person to handle a State Grant when they have been barred from handling Federal Grants. 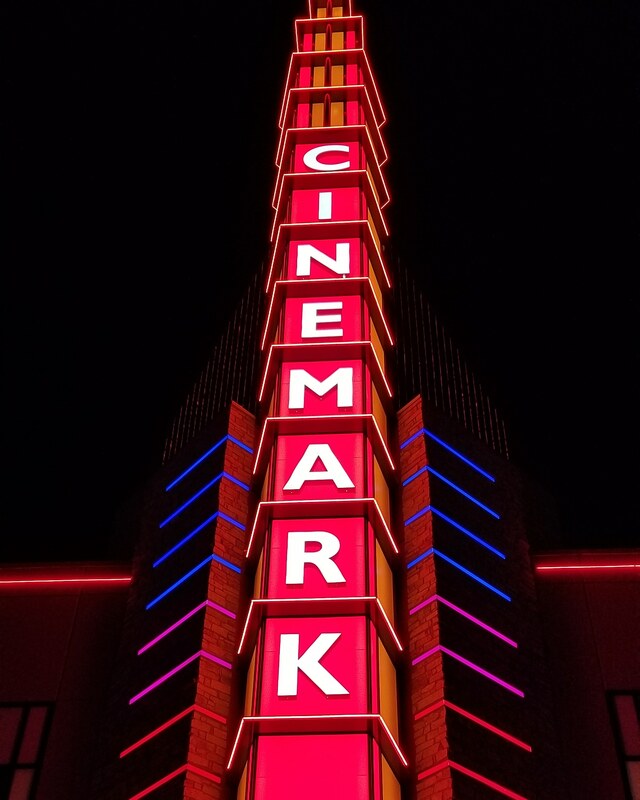 As this grant was being written various local organizations were asked if they would be able to offer supports to provide services to the grant program. Some that offered letters of support or programs to make the grant possible are becoming concerned as they learn about the grant manager and the problems that have existed with the Federal Grant Disbarment. 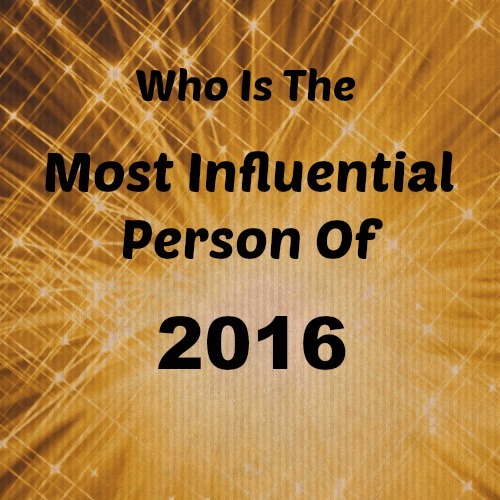 Come one come all to our 2nd annual Most Influential Person in Rialto poll. Last year we had three great people responsible for making Rialto a great place to live work and play. The last week of 2016 we ran a post looking for your nominations and we also pulled some choices here from the staff at Rialto Now. Were super excited to see who comes out on top for this years post. The rules are simple all you have to do is vote and we will do the rest. 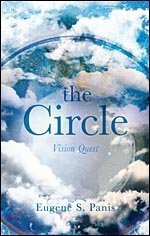 There are safeguards to keep people from stacking the deck but were not asking you for any information just your votes. Voting will end January 8th 2017 at Midnight. 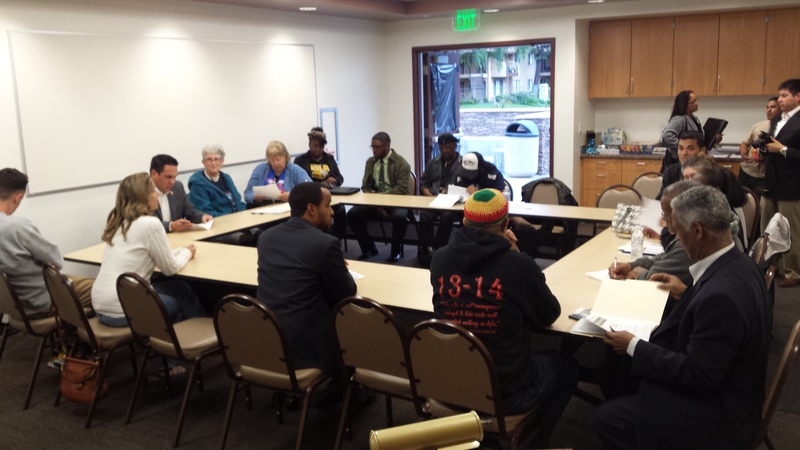 On Tuesday the Rialto Community Coalition held their regular monthly meeting Tuesday April 7th. The Agenda originally had one item working on developing a Youth Leadership Conference, a last minute addition made the meeting run over. 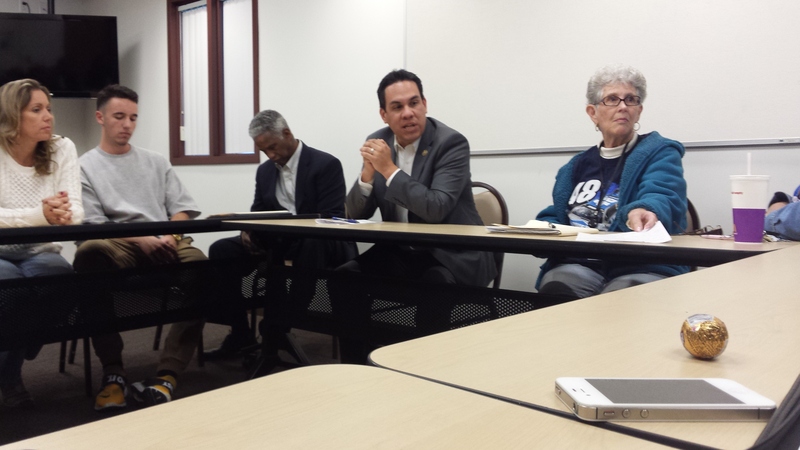 Congressman Aguilar who is home in the district came to sit in on the meeting and offer support where he could. The meeting was well attended and their were people from all sections of the community in attendance. 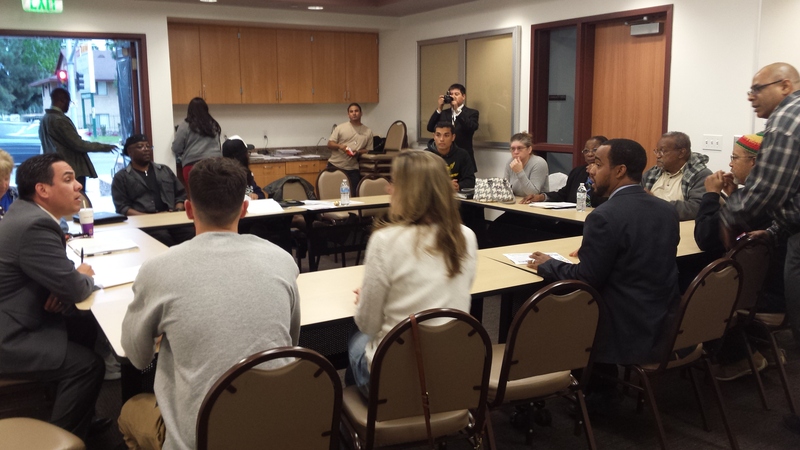 Joseph Williams from YAP (Youth Action Project) introduced Congressman Aguilar and offered a platform for Congressman Aguilar to address the group. Congressman Aguilar spoke about the work he was a part of when a elected member of Redlands City Government in regards to Redlands Social Host Ordnance and their Safe Places program where the city helped create safe opportunities for students. Congressman ended his time by offering support from his office where the Coalition needs it. The meeting was very well attended and headway was accomplished in regards to the Youth Leadership Conference. What was accomplished was a location, date and there was some discussion on what types of workshops would be provided. This meeting was not only adults but youth had a key roll in developing this conference. There were youth from Carter High School’s BLSA Club, Middle School Students from the Rialto area, youth from Etiwanda High School & local Christian Youth Speaker Rizzy Rider. Some of the desired outcomes that the coalition wanted to see come from this effort was to see students become Rock Stars in their groups when it comes to Drug & Alcohol use, to see teens succeed beyond their circumstances and continue to see a positive change in the illegal use of drugs and alcohol through education. Agencies and organizations in attendance were Lil Saints Productions, Carter High School, Congressman Aguilar’s office, All Nations Realty, Etiwanda High School, Rialto Democrat Club, Vibe Fitness, Rialto Police Volunteers, Rialto Neighborhood Watch Program, SOLA Communities, Transforming Lives Charter School, Market Solution Services & Inland Valley Drug Free Coalition. 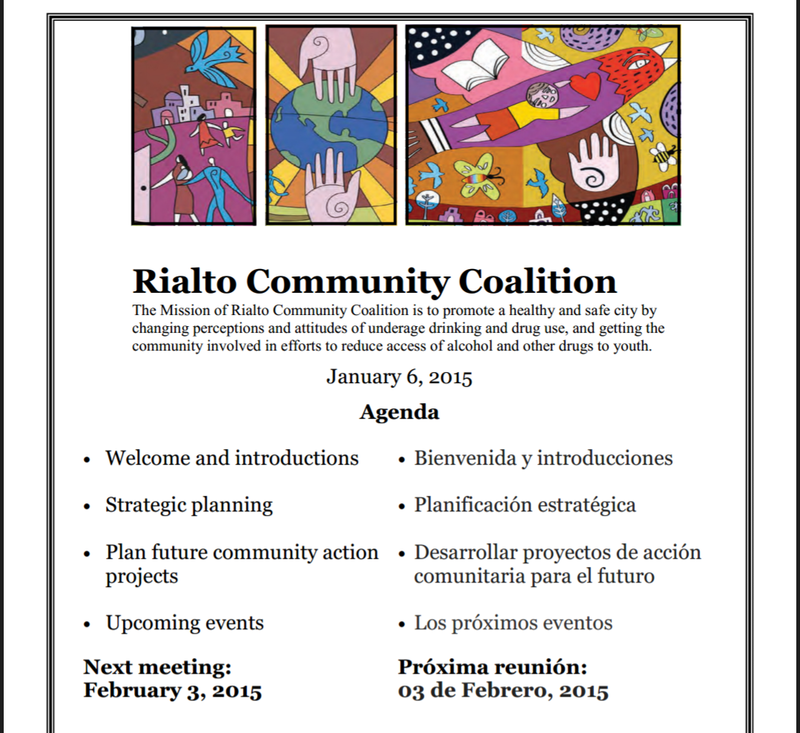 Please join us at the Rialto Community Coalition meeting on Tuesday, January 6, 2015 at 6:30PM. 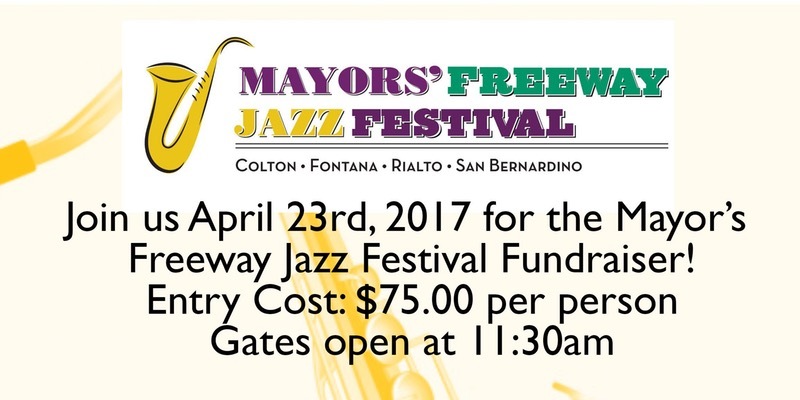 The meeting will be held at the Rialto Fire Station located at 1700 N. Riverside Avenue Rialto, CA 92376. Rialto Community Coalition members meet monthly to promote a healthy and safe city by changing perceptions and attitudes of underage drinking and drug use. We’d like to get more community members involved with our efforts to reduce youth access to alcohol and other drugs so please invite your friends and neighbors to join us. We will developing strategic plansand new community action projects for 2015.